This is a very cute book written as a Christmas gift to the author's children. Knowing the reason why the book was written just adds to the overall special feeling! "Mu, a ten-year-old orphan, has lived his entire life in the heart of Africa. For as long as he can remember he has served in the household of a great-uncle where he is unloved and ignored. In his drudgery-filled life, Mu has little hope of happiness, and little hope that anything will ever change. But one day, everything does change. 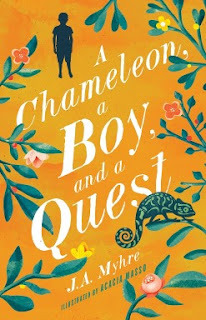 On his way to draw water one morning, Mu is astonished when a chameleongreets him by name and announces that they will embark on a quest together. And what a quest it turns out to be! Mu faces danger and finds unexpected allies as they journey through a fascinating and ever-changing landscape. A Chameleon, a Boy, and a Quest blends magical realism with a compelling story. The exciting story line combines an orphan's journey to find a home with the plight of child soldiers and the dangers of the Ebola virus and, along the way, highlights universal themes of integrity, loyalty, faith, and love. Written by long-time medical missionary J. A. Myrhe, the artful story is laced with subtle gospel themes and handles cross-cultural issues with grace and sensitivity. Kids will encounter good and evil and learn the truth about hope, happiness, and what it means to be human in this page-turning first book in a new series. Written by a long-time medical missionary to Africa who handles cross-cultural issues with grace, sensitivity, and love"
"J. A. Myhre serves as a doctor with Serge in East Africa where she has worked for over two decades. She is passionate about health care for the poor, training local doctors and nurses, promoting childhood nutrition and development, and being the hands of Jesus in the hardest places. She is married to her best friend and colleague Scott, and together they have raised four children for whom many of her stories were written as Christmas presents." Overall, we really enjoyed this book. It is not large, but it is also not a story book sized book either. The illustrations are FANASTIC, and the artist is someone who had first hand experience with the stories as they were created. I liken this as a fantastical African Narnia experience. J.A. Myhre paints a beautiful picture with words and storyline that is hard to put down once you pick it up. A+!